Practitioners of past life regressions often ask their clients, in their relaxed states, to look down at their feet as they embark upon their journeys into prior incarnations. The rationale is that the state and style of one’s footwear will signify a specific period of time as well as one’s general position in life. Although hiring managers confine their interview questions to applicants’ current lives and fairly recent job histories, don’t assume that employers do not place great emphasis on candidates’ footwear, for it is a fact that most do! Worn heels, scuffed toes, and fraying laces indicate that the wearer has a tendency to overlook details or shove small, unpleasant tasks under the rug (obviously, not good qualities in potential employees). Any type of sandal, including open toes, sling backs, or God forbid, flip flops, announce a somewhat carefree applicant who is not completely serious about the job. The same, and worse, can be said of stiletto heels. No industrious employee can get much done in a pair of skyscrapers, and that includes the male employees ogling the killer heels. Thick, shear-lined boots are suitable for Alaskan pikers, and construction boots are for those laboring on a worksite, not seeking employment in an office or field sales environment. With the transit strike of the early ’80’s, running shoes became a staple in the professional wardrobes of New Yorkers forced to take to the streets and bridges in order to commute to and from work. However, once in the office, the Nikes® and Reeboks® were stashed away in desk drawers and replaced by more suitable footwear. Therefore, avoid running shoes, tennis shoes, and sneakers while interviewing. Men, unless you’re auditioning for a role as Buster Brown or The Little Dutch Boy, deep six shoes with buckles and tassels. Ditto metal studs or another features normally donned by bikers, hard rockers, and cowboys. And remember the rule of thumb pounded into you by your fashion-savvy significant other: wear no shoes of a color “not found in nature.” What we ladies mean is, please confine your color choices to black, deep brown, or dark gray in a tasteful lace up or “tongue” style. Vegetarians, we have bad news for you: tanned leather is the material of choice when interviewing. Patent leather smacks of grade school…including yes, the legend told by the nuns. Reserve funky wedges, platforms, rhinestones, and flower accents for a revival of Hair or the dance floor, not the job interview. Your best and safest choice is to invest in two pairs of decent, black leather shoes: sensible pumps for women and classic styles for men. With all the running around you’ll be doing while interviewing, your shoes are going to incur some damage. 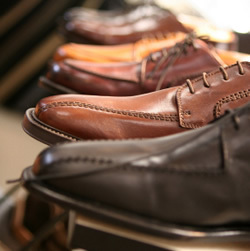 Have a spare, pristine pair waiting in the wings while you have the first pair resoled, polished, and buffed. Budget-conscious job seekers will want to visit discount retailers, such as DSW, which carries a dizzying array of styles for both men and women. Sign up for the store’s rewards program and you’ll receive discount coupons periodically in the mail.